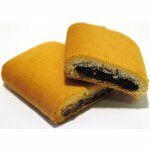 National Fig Newton Day is a food holiday celebrated on January 16. It is dedicated to Fig Newtons – cookies filled with fig paste that are a trademarked version of the fig roll manufactured by Nabisco. Fig rolls were invented in ancient Egypt. They have become a popular snack food in many countries all over the world over time. Mass production of fig rolls in the United States became possible thanks to Charles Roser, a baker from Philadelphia. In 1891, he invented a machine for inserting fig paste into a thick pastry dough. His recipe was purchased by Kennedy Biscuit Company based in Cambridgeport, Massachusetts. The first Fig Newtons were baked at the F. A. Kennedy Steam Bakery in that same year. The new cookies were named after the town of Newton, Massachusetts though some people mistakenly believe that they were named after Sir Isaac Newton, a renowned English physicist and mathematician. When the bakery was purchased by Nabisco, the cookies were trademarked as Fig Newtons. They are in the company's top 3 best-selling products. Nabisco also manufactures other varieties of the Newton, including raspberry, strawberry, mixed berry and apple cinnamon. The unusual shape of these cookies has been adopted by many competitors.